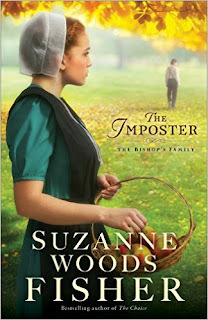 "The Imposter" by Suzanne Woods Fisher is the first book in the "The Bishop's Family" series. It is Katrina Stoltzfus' story, but also that of her father David, her brother Jesse, and of Birdy Glick. Katrina thinks she knows how her life will play out, but when her plans crumble, she needs to find her place in the world. She is baffled by her interest in the new farmhand, Andy Miller. Is he too good to be true? Meanwhile, David Stoltzfus is trying to lead the church according to God's will and the Bible. When the bishop of the church seems out to get him, what will he do? Birdy Glick has never been the ideal specimen of a lady. She's much to large and clumsy for that. What is she to do when her heart longs for David Stoltzfus and her brother seems out to get him? Jesse is a restless soul. Always on the lookout for some action. Will he be able to put his old ways behind him and take on the responsibilities that are laid at his feet? There is a lot going on in this book with all the people it follows. I felt immersed in the story and the community of Stoney Ridge. I wanted the good to prevail and for them to get their happily ever afters. The storylines don't seem completely wrapped up, but it isn't really a cliffhanger ending, either. I really enjoyed reading "The Imposter" and found it quick to read. I received a free copy of this book from the publisher in order for me to review it. No other compensation was received and a positive review was not required. All thoughts and opinions are my own. "The Horse of my Heart" is a collection of 32 true short stories about how horses have impacted the authors' lives. 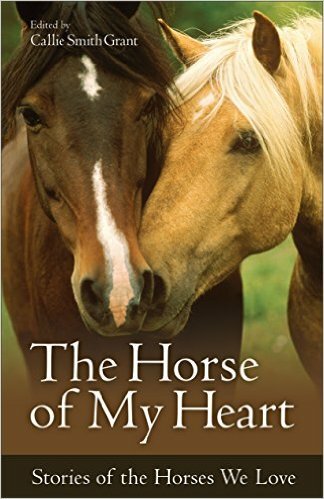 I mostly got this book because my daughter loves horses. Her dream horse is all black except for one white front leg and a star. She adored this book. Her favorite stories were "The Pasture Bully", "A Horse Named Gentle Breeze", "Rocky", "Dynamite", and "Swimming with Cheetah". She found that many of the stories could teach lessons. I found the stories to be quick and fun to read. There were a variety of types of stories and, like my daughter, thought that many would be good object lessons. In between the stories there are little factoids about horses in general and about specific "famous" horses. I thought the book to be fun and delightful. It was nice to be able to pick up when I only had a few minutes and read another of the stories. I received a free copy of this book from the publisher in exchange for my honest review. I received no other compensation and all thoughts and opinions are my own. Leila Lantz hasn't lived in Bee County long, but she was in love with Jesse Glick from the first time she saw him. Lately, he's been acting strangely, like he wants to court her but he doesn't. Will he figure out what God wants for him to do and how to not hurt Leila? Jesse's cousin, Will has feelings for Leila, also, but hesitates to make his intentions known since he doesn't want to hone in on Jesse's girl. He doesn't want Leila to get hurt, but is he thinking of only himself, or her? I had a hard time putting the book down. I felt for both of the guys and Leila and the struggle that they were going through. I found myself tense as I waded through the decisions that they had to make about their futures. I had a hard time deciding which guy I thought Leila should choose. (She didn't pick the one I did). I felt a part of their world. I got emotionally involved in their lives. "The Bishop's Son" is the second book in "The Amish of Bee County Novels". I did not read the first one, but I wished that I had. I would have given me more of the story of the lives of the people of the community. I received a free copy of this book from the publisher in order for me to give my honest opinion. No other compensation was received. I was not required to give a positive review and all thoughts and opinions are my own. 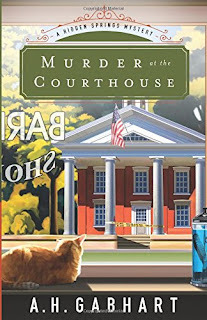 "Murder at the Courthouse" by A.H. Gabhart is the first book of "The Hidden Springs Mysteries". Michael Keane left his job as a police officer in Columbus to come home to Hidden Springs where nothing eventful ever happens. That is until a body turns up on the steps of the the courthouse. As he investigates, Michael realizes things aren't always what they seem. 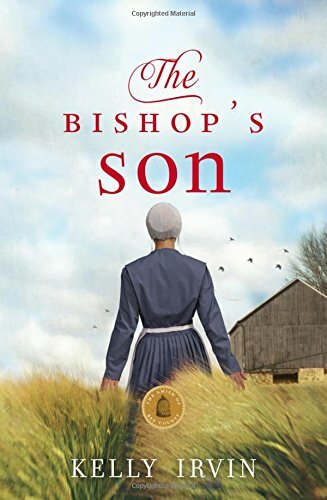 I found the book to be well written and I liked Michael and his desire to help Anthony Blake, the "problem child" of the town. 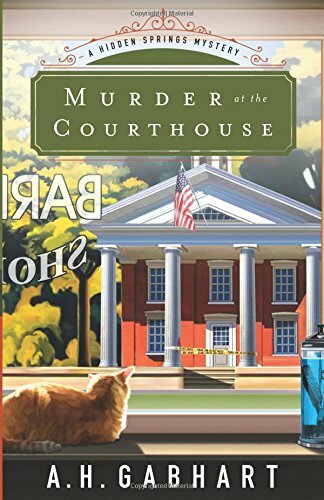 I had a feeling who the murderer was at the beginning of the book and as the story progressed, more and more of that person's actions confirmed my suspicions until the big "reveal" and I was right. I prefer to not be able to figure out the mystery (at least not as soon). There also was not very much of a romantic element like I thought there'd be. Michael is sort of dating a woman named Karen, but what put me off was that Karen was a pastor. I believe that pastors should be men. There were a couple of kisses in the book and some hand holding. I also found the back blurb to be wrong. It says that the "sheriff insists Michael check out one of the harebrained theories", but in the book, Michael just follows a hunch/gut feeling and it didn't have anything to do with what the sheriff said or told him to do. I received a free copy of this book from Revell in exchange for my honest review. I was not compensated in any way and all thoughts and opinions are my own. 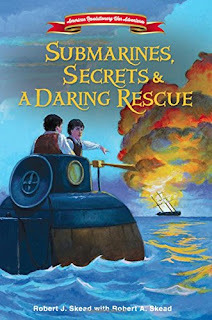 "Submarines, Secrets, & A Daring Rescue" by Robert J. Skead with Robert A. Skead is the 2nd book in the American Revolutionary War Adventures series. Identical twins John and Ambrose Clark are once again called upon to aid the Patriots in their war for independence. They must transport much needed gunpowder. Will they be able to carry out their task safely? This book gives readers a look into the history of the period during the American Revolutionary War. The interesting chapter titles, varying chapter lengths, and the pictures also help to pull the reader into the story. While the first book was given from John's point of view, this one is from Ambrose's point of view (along with Berty and Lamberton at times). I liked seeing the interactions between the twins. There is action, adventure, and suspense that makes this a book that is hard to put down. The authors tweaked a few historical details to fit their story, but it is mainly based on actual history. The back of the book includes discussion questions, Historical Characters, a glossary, and Historical letters. I really enjoyed reading this book (even though I'm not in the target audience) as did my daughter (who is in the target audience). We would recommend it. I was given a free copy of this book by Booklookbloggers in exchange for my honest review. I received no other compensation and all thoughts and opinions are my own. I attended my very first writers conference over the weekend. You can read about it on my author blog.